The Black Muslim presence in Kenwood is apparent at the corner of 49th and Woodlawn. On both the northeast and northwest corners are buildings that serve that religious community. The home of the late Elijah Muhammad, with its beautiful stained glass windows, stands on the northeast corner. The opposite corner contains several townhouses for the Muslim sisterhood. The Black Muslims had a very positive impact on Kenwood in the 1960s and 1970s through construction of new housing for its members and through social programs. 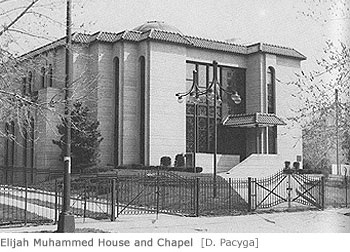 The above photograph shows the Elijah Muhammad House and Chapel at the northeast corner of 46th and Woodlawn in 1985. This Kenwood home was the center of Chicago's Nation of Islam during the last years of the Right Honorable Elijah Muhammad. As you continue south on Woodlawn, you will see many examples of fine residential architecture on both sides of the street. The second house from the corner of 50th Street on the west side of the street is the former home of boxing great Mohammad Ali, who moved to Kenwood in the 1960s to be near his spiritual mentor, Elijah Muhammed.